Believe it or not, I've been known to recommend a book or two right here on this blog, but this time I'm the one asking for recommendations from trusted readers and friends. *gasp* My daughter Nika, who turned 8 in March, is a pretty advanced reader in her first language (which is Croatian). She reads well above her grade level and she really loves books, which warms my little heart. Just recently, I challenged her to start reading in English, and let me tell you, she may take after her fatherin most other things, but she's her mama's daughter in that she never backs down from a challenge. But we're picky readers, she and I, and now we're looking for recommendations and ideas. 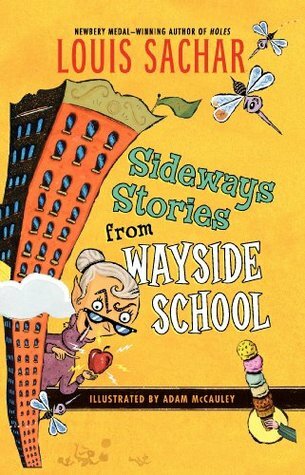 I've been reading to her in both languages from day one, but the first book she finished in English all on her own was Sideways Stories from Wayside School, which was a gift from my wonderful friend Flannery. She absolutely adored it, and the format (very short connected stories) made it easier for her to follow in a foreign language. From there we progressed to Madonna's English Roses, which were surprisingly delightful. The first one was also a present (I doubt I would have bought it, I'm prejudiced like that), and the second she finished it, I ordered all the other books and we're currently going through them. For a girl of 8, they're about as good as it gets - funny, eloquent and educational. Whether Madonna herself wrote them is open for discussion, but the books are absolutely marvelous and the illustrations in the big, glossy hardcover edition are breathtaking. Just the other day, I ordered a copy of Liesl & Po by Lauren Oliver for her because I've heard so many great things about it. We'll see how she likes it. Now, this is where I turn to you, my friends. I was never really interested in Middle Grade books, not even when I was that age, and I definitely wasn't reading in English back then nor was I educated in an English speaking country. If you have any ideas or recommendations, something you stumbled upon recently or a childhood favorite, please share it in the comments. Nika and I will be very grateful. Aw. I love your daughter's name, Maja! I wish my son (who's also 8) is into story books. He's more the National Geographic type of reader. No complaints from mom, though! I love that he throws spews out random facts like an encyclopedia. Lol. Hmm...I'm trying to think of things that I read and really loved when I WAS around that age. I loved to read, but it's different when English isn't your first language I'm sure. More classic books would be anything by Roald Dahl or Stuart Little by E.B.White - maybe something like that? I'm always looking for good MG recs so thanks so much Maja! I don'treally read MG but they look fun! thanks for sharing! I don't read MG books but I'm always looking for recs to give to friends' kids! The English Roses sound like they would be fun. I run across a MG now and again but I usually recommend it to a family member than forget... except those I know you already know about (like the many HP fandom books people recommend). YaY! For your daughter taking after you in reading! I miss reading middle grade. My kids have aged out of it. *sobs* I need to find the time to read a few MG books because they're so fantastic! I wish I had some MG recommendations for you Maja, but that's one genre I'm not overly familiar with. I'm always on the lookout for recs for my nieces/cousins though, they're really getting into reading which of course makes me happy:) Love that your daughter is taking after you in the book-loving department! I don't read much MG myself but I can highly recommend a series that it's like Agatha Christie for younger readers by the lovely Robin Stevens! There are two books out, Murder is Bad Manners and Arsenic for Tea, and a third one coming out in late July called First Class Murder. Murder mysteries, boarding schools, diverse characters... I adore these! And another two lovely MG books I can highly recommend are All Four Stars and The Stars of Summer by Tara Dairman. Delightful, witty and with loads of food (that's always a plus for me!). I've also heard great things about Monstrous by MarcyKate Connolly although I haven't read it myself. Maybe try Ella Enchanted or A Tale of Two Castles by Gail Carson Levine, The Secrets of the Immortal Nicholas Flamel series by Michael Scott, and The School of Good and Evil series by Soman Chainani? I heard from a friend that her daughter loved Shannon Hale's Princess Academy series and also the Goddess Girls series by Joan Holub and Suzanne Williams, and English is not her first language. Hope this may help. The first book that popped into my mind is Ella Enchanted. Two Canadian authors whose books I enjoyed when I was young are Gordon Korman - I loved his Macdonald Hall series - and Kenneth Oppel - I read his Silverwing series. My 13 year old brother loves Rick Riordan's books.